I'm not tryna hate on a beautiful thing, but once again they centered this WHOLE thing around P.Diddy even though he wasn't the one pushing these 2 girls out his cootch. You can barely see Kims face, this should be her moment. I see Baby Daddy extraordinaire took time to for a photo opp between his highly publicized creep sessions. Am I the only one bothered by the fact Kim is looking at his whackness instead of the girls *rolls eyes*. Kim is a professional baby mama. she needs some self respect. Kim is so pretty. That skin , those white teeth and her gorgeous hair! Those babies are soo pretty. Does'nt she have a baby for biggy? 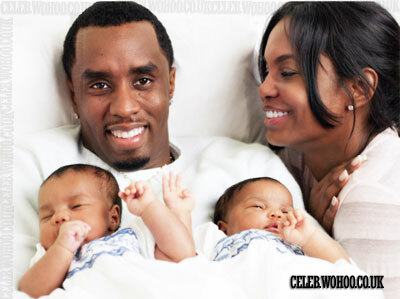 kim had these babies for diddy (in vitro if you ask me) she wants this picture to be about him. Had it not been for the two girls dude wouldve already been onto someone else. believe that. im just so sorry and sad for her that she's consistantly allowed him to make her his option while she views him as a priority. when will she learn a baby doesnt keep a man!